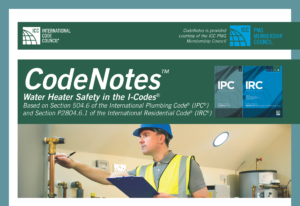 As part of its goal to serve the needs of plumbing, mechanical and fuel gas officials, the ICC PMG Official Membership Council is committed to providing informative code support documents such as CodesNotes. Topics include backflow devices and protection of water supply, gas pipe sizing based on the 2009 IFGC and IRC, and bonding of corrugated stainless steel tubing gas piping system. Click below to view free copies, courtesy of the ICC PMG Official Membership Council. The water heater installed in a home can be a ticking time bomb if not installed correctly or maintained properly. A water heater temperature and pressure relief valve is an important safety device for water heaters as well as the water distribution system to which it is connected. Any water discharge from the relief valve is an indication of an underlying problem. This CodeNotes™ addresses the important code provisions associated with the relief valve. These items are mentioned in Section 504.6 of the IPC and Section P2804.6.1 of the IRC. Solar water heating systems provide an efficient way to meet hot water loads in most climates. Unlike photovoltaic (PV) systems that generate electricity, most solar water heating systems directly heat fluids using solar energy. Fluid flows through outdoor solar thermal collectors where it is warmed by the sun. This CodeNotes™ provides a description of the most common solar water heating systems used for residential and small commercial applications along with suggestions for inspecting them in accordance with the requirements found in the 2018 I-Codes. The control of fire and smoke is a major concern in the International Building Code (IBC®) and International Mechanical Code (IMC®). This edition of CodeNotes provides the reader with an understanding of the detailed requirements on these issues from an overall building construction viewpoint. The IBC and IMC contain many requirements and construction techniques intended to limit or control the spread of fire and smoke within a building. Firestopping is a Life Safety topic addressed in the International Plumbing Code, but only briefly. The bulk of this topic is addressed within the International Building Code. 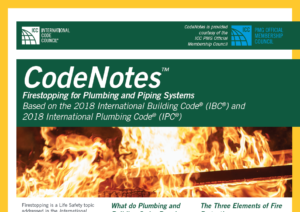 This edition of CodeNotes introduces the reader to what the building code and plumbing code requires, regarding firestopping. 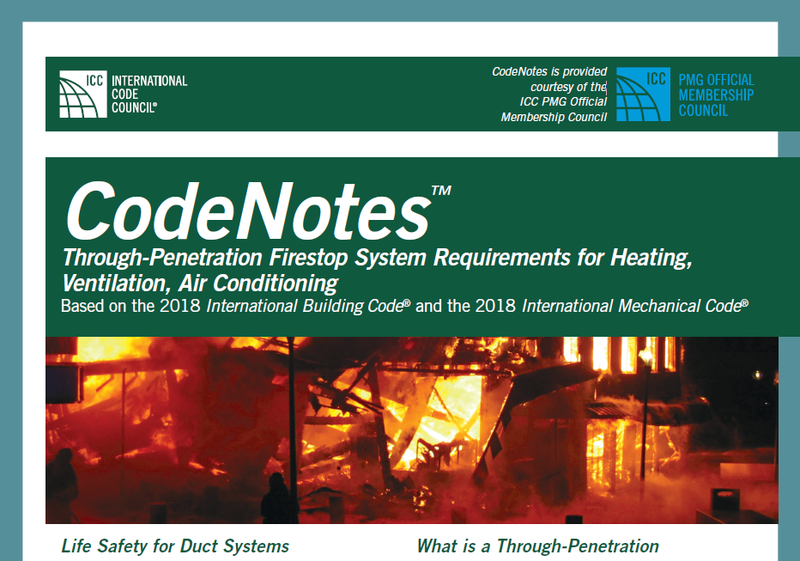 This edition of CodeNotes discusses a new section that was added to the 2018 editions of the International Fuel Gas Code and the International Residential Code. It addresses arc-resistant CSST products. This edition of CodeNotes provides the reader with an understanding of the design process. Achieving occupant satisfaction is the principle goal of any HVAC design. Manual J allows contractors to perform a load calculation on a residential building/home. The 2015 ISPSC® Residential Swimming Pool and Spa Permit & Plan Guidelines CodeNotes™ provides a guide for state and local jurisdictions for plan submittals of residential swimming pools and spas. The intent is to provide additional clarity for the installation of a residential swimming pool and spa. The 2015 International Mechanical Code (IMC®) addresses the safety of occupants in buildings, and provides for protection for service and inspection personnel. The 2015 CodeNotes will provide you with an overview of pipe sizing calculations and requirements in the 2015 International Fuel Gas Code (IFGC) and 2015 International Residential Code (IRC). The 2015 version has been updated with new graphics and include the latest code changes. This CodeNotes™ provides an overview of entry/exit requirements of the 2015 International Swimming Pool and Spa Code® (ISPSC®) as they pertain to permanent inground residential swimming pools. This CodeNotes provides an overview of the velocity limits noted in the 2015 International Swimming Pool and Spa Code® (ISPSC®). Velocity is used to help designers select the minimum pipe size for the design flow rate for a specific application. Improperly designed systems lead to highly inefficient systems creating high pressure, excessive noise, vibration, and potentially decreased equipment life. 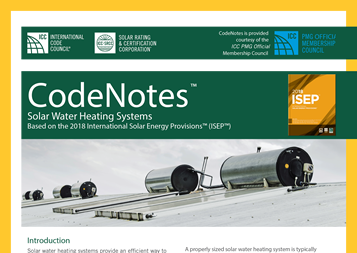 This edition of CodeNotes provides a description of the most common solar water heating systems used in residential and small commercial applications, and suggestions for inspecting them in accordance with the requirements found in 2015 International Codes®. Discusses revisions to the 2015 editions of the International Fuel Gas Code and the International Residential Code for requirements in the electrical protection of corrugated stainless steel tubing through an extra bonding connection. This 2015 CodeNotes will help you understand the importance of protecting the potable water supply, identifying potential threats and determining the appropriate backflow preventer. IPC Table 608.1/IRC Table 2902.3.1 (Application of Backflow Preventers) has been provided to assist the user in selecting a suitable method or device for the application. This CodeNotes provides an overview of pipe sizing calculations and requirements in the 2009 International Fuel Gas Code (IFGC) and 2009 International Residential Code (IRC). It will cover both the longest length method and the branch length method. Applicable code tables, figures and example problems and solutions are provided for each method to help the reader easily understand the pipe sizing methodology. This CodeNotes provides cross-connection scenarios and back flow prevention methods and devices in an organized and user-friendly approach in accordance with the requirements of the 2006 and 2009 International Plumbing Code and International Residential Code.